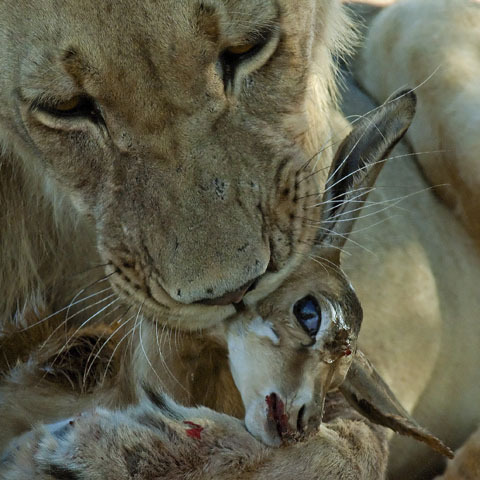 Wildlife Photography opportunities are abundant in Southern Africa. Photographing African Wildlife is 'big-game photography' and there are very few places left in the world where you can experience the traditional big-game photographic safari. 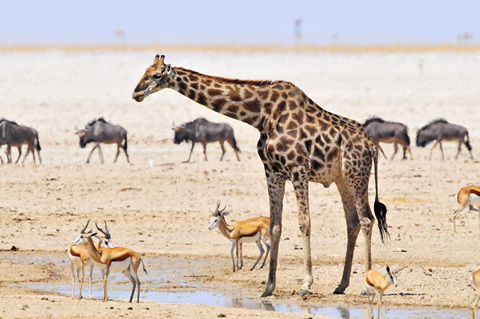 In Etosha the winter months from June - September and maybe even extending into October, are the very best for game viewing and wildlife photography as the animals come to you at the waterholes. Why go chasing all over the parks looking for animals when you can sit in one place with a beer or cold-drink and photograph non-stop day and night!? As a photographer you want to practice and fill your compact flash cards every day and Etosha allows you to do this. Add to this the fact that the park is open thereby allowing good photographs with very little bush obstructing your subject and you have a winner! There are about 50 waterholes and springs along the tourist roads between Galton Gate in the west and Von Lindequist Gate in the east, of which 70% are most productive for animal photography. Each of the three main camps has its own waterhole that can be viewed from inside the camps. Okaukuejo waterhole could be the best waterhole in Africa during the winter months! There is a constant procession of animals day and night! 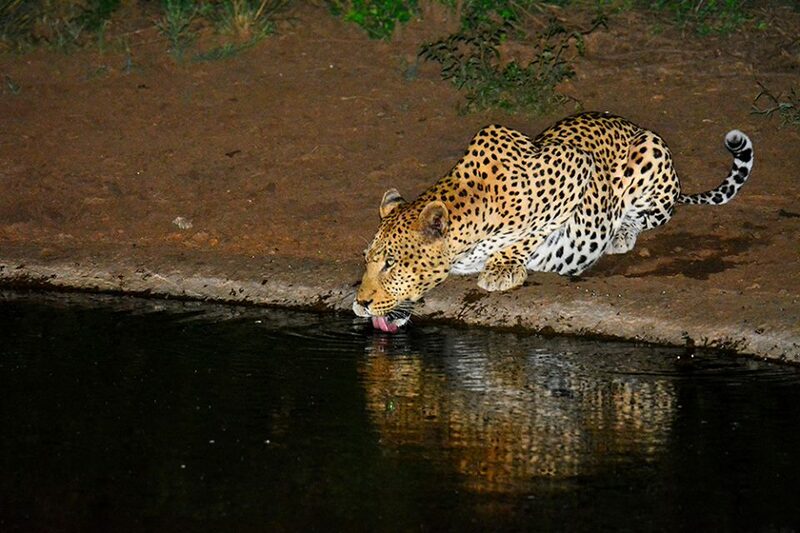 The Moringa water (in Halali camp) is superb by night and if you want to see a leopard this is the place to be! The Namutoni waterhole is not so good. Dolomite camp also has its own waterhole that is also productive in the winter months but Onkoshi camp does not have a waterhole as it is located on the edge of Etosha Pan. The camp waterholes are about 50 meters away from the viewing area so you don't need a super telephoto lens. We do use our 600mm lens for the smaller animals such as African Wild Cat but for elephants, giraffe and rhinos we use a 200mm lens. If you don't want to stay inside the park there are many lodges outside the park such as Onguma The Fort near Von Lindequist Gate, Etosha Safari Lodge near Andersson Gate, and Toko Lodge near Galton Gate. NB: The new Galton Gate Route through Western Etosha officially opened for all tourists on the 28th February 2014, which means that any visitor can now enter Galton Gate, not just residents staying at Dolomite Camp! The best months for wildlife photography, particularly for predators and raptors, are the summer and autumn months. Summers can, however, get extremely hot so for comfort we prefer to visit the park in March and April. All game drives are done along just four roads - the two main river roads of the Auob and Nossob and the two connecting dune roads. There are a series of boreholes situated along the four roads, which attract the prey and predators. 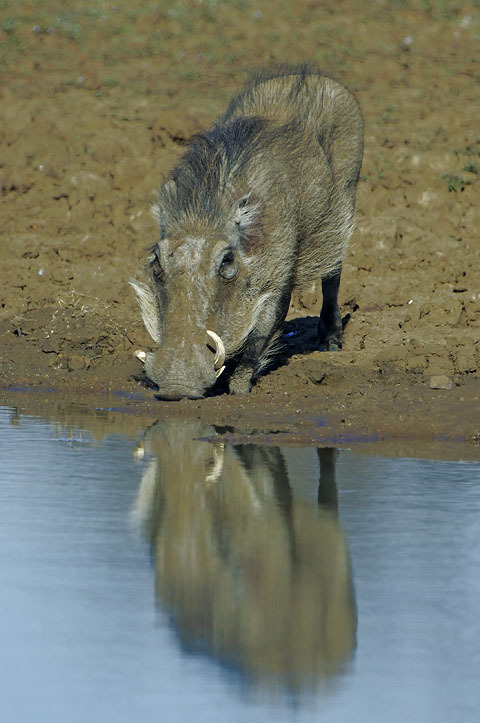 There are also waterholes in front of the main camps (Nossob and Mata Mata) and in front of all the wilderness camps. We love the Wilderness Camps as they are quieter than the main camps and we tend to therefore see the shy creatures such as brown hyena, porcupine and caracal drinking here. 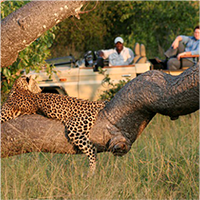 For photography Urikaruus is the best wilderness camp because the waterhole is just 50 meters from the cabins. At the other wilderness camps the waterholes are between 75 and 100 meters from the cabins. Sometimes the animals are close to the waterholes and sometimes they aren't so we would suggest that you have at least a 300mm f4 lens plus tele-converter. Because the Kruger has dense vegetation you may not find animals as quickly as you will in the more open parks of Etosha and Kgalagadi. For this reason we suggest you stay for a longer period. 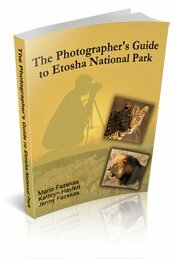 We have been to Etosha for 6 days and every day we filled up our memory cards but in the Kruger it may take us a few days to fill up one card. 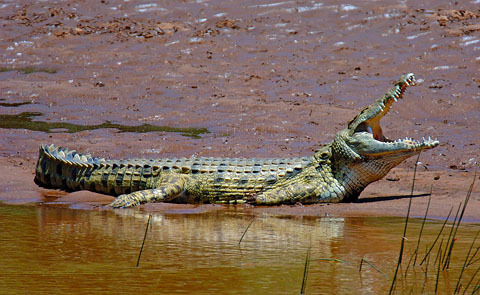 Not because there are less animals in the Kruger but because they are more difficult to find and to photograph. The Kruger is over 350 kilometers long from north to south and the diverse geology and landscapes of the park make up fifteen different ecozones! The main camps and bushveld camps are situated in these different ecozones so some camps will be more suited to certain animals than others. If you are looking for the Big-5 animals or Super-seven, your best chance of finding and photographing them all will be in the south of the park. If you are looking for the rare roan or eland then the north will be the best. Some people say that the winter months are the best time for wildlife photography but we have had good sightings all through the year! 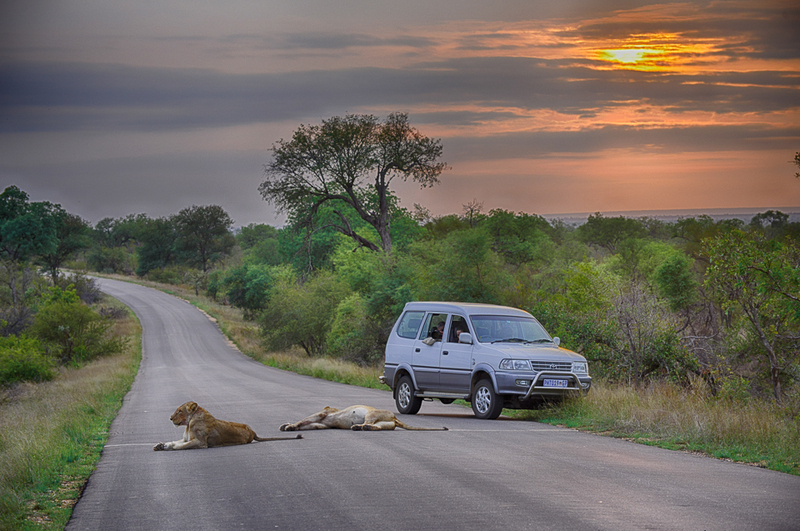 There are so many animals in the Kruger, of which the majority are habituated to vehicles, that any month can be a good month for game viewing. The big plus for winter is that the grass will be shorter and the bush a bit thinner. The south can get very busy so it may be better for you to drive along the dirt roads and if you do see a subject you will be able to spend more time photographing it before 'the mob' arrives. And of course don't forget you can get some great photographs from within the camps! We have photographed vervet monkeys, baboons, squirrels, mongoose, genet, civet, bush babies and many of the Elusive-eleven animals from the comfort of our bungalows. In addition we have photographed the big-five from inside the camps - camps like Olifants, Lower Sabie and Skukuza provide good vantage points to see the animals coming down to the rivers to drink and hunt. Game viewing and wildlife photography in the Pilanesberg are best towards the end of winter (September/October) when the grass is at its shortest and the veld fires have thinned out the grass providing large open areas to enable you to see the animals better. The winter months are also the best times to sit at the Bird Hides and watch the animals come down to drink. Rhinos are very common sightings, especially the white rhino. Buffalo and leopard, which are relatively easy to spot in the Kruger, are very rare sightings in the Pilanesberg. Conversely, brown hyena, sable and eland, which are rare sightings in the Kruger, tend to be easy to see in the Pilanesberg. For both the Kruger and Pilanesberg we suggest you bring the longest lens you have - sometimes the animals will be close to you but in most cases they will be far away and a super telephoto lens will be a necessity for quality photographs. At least a 300mm f4 with 1.4X teleconverter would be the minimum required. You can find the super-seven animals in the park – buffalo, elephant, rhino (both black & white), leopard and lion (the big-5) plus wild dogs and cheetah. 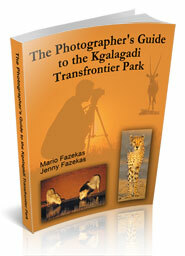 However, the field guides of Madikwe prefer to focus on the “Top 10” animals rather than just the Big Five. So they have added hippo, giraffe and hyena (brown and spotted) to the super-seven to make the Madikwe “Top-Ten". Hippo, black rhino and Leopards tend to be difficult to find but, in recent months, leopard sightings have started to increase in the park as the lion population was halved. who are all professional Wildlife Photographers, most of whom have photographed in the above four national parks and who offer some great advice. If you are a beginner and find it difficult to relate to these professional wildlife photographers then you must read our interview with Billy Dodson. Billy is a unique success story - he started selling his photos from his first trip to Africa and he won a prestigious photo contest just 2 years after taking up photography! Billy Dodson is one of the best examples of inspiration for a beginner or even intermediate photographer. If Billy can do it so can you! 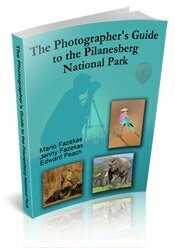 • Photographic equipment for wildlife photography is virtually the same as what is needed for bird photography - long lenses, good support in terms of tripods, bean bags, gimbal heads and so forth. To learn what wildlife photo gear we use please visit the Nature Photo Gear page. • Panning is a wildlife photography technique that is well worth learning, especially for those days when the sun simply doesn't want to shine!